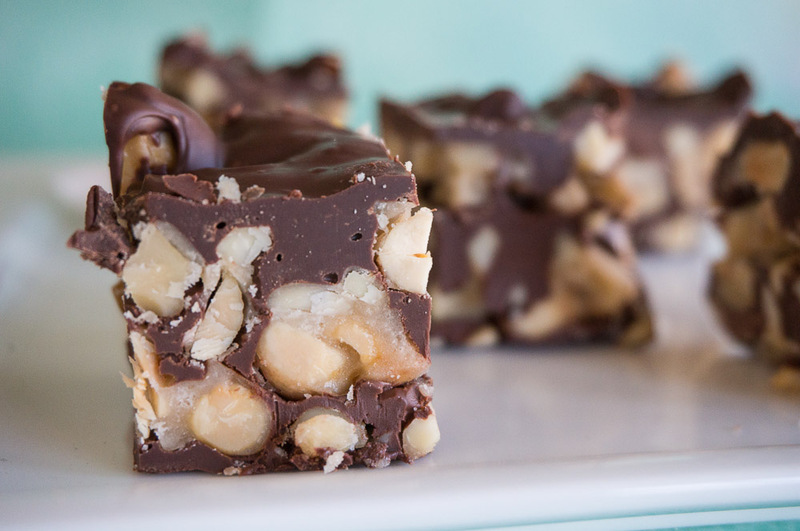 While I always make Chocolate Covered Toffee Matzos for passover (because, uh, tasty!!) 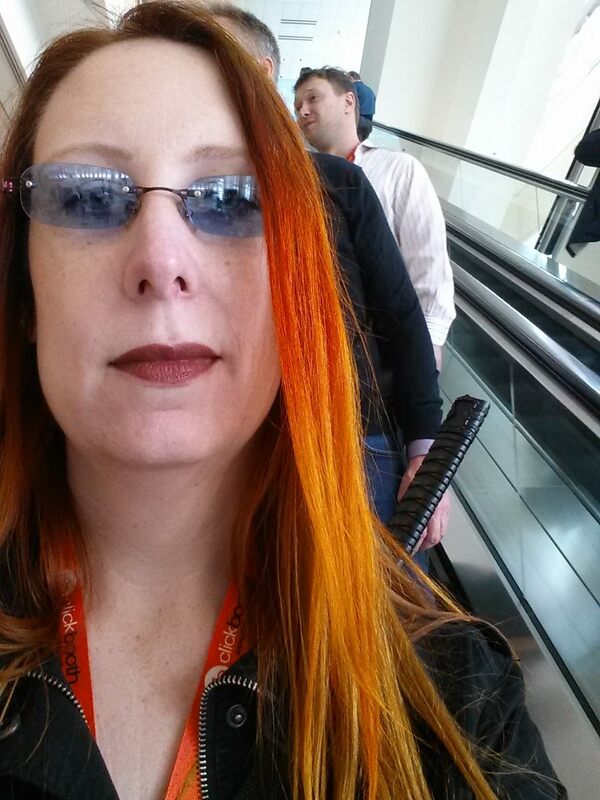 I felt like I should think of something different. 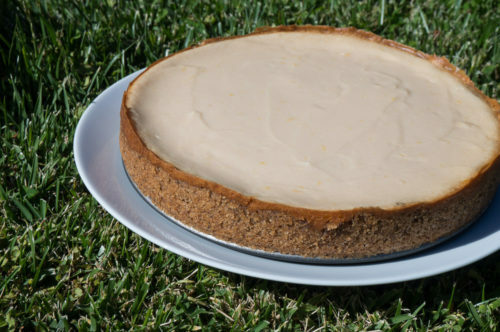 Passover and Easter collide today in this #SundaySupper and I made a lemon cheesecake. This afternoon we’re going to a Seder, a first for an Easter tradition to be sure, but this cheesecake had to be made in advance so it might have disappeared before today (hey, Pesach is 7 days!). We went last year and have such an awesome group of friends that I’m honestly pretty excited to celebrate. For Easter we generally hang out around the house, eat chocolate and chill out with video games. But today if going to be a blast! 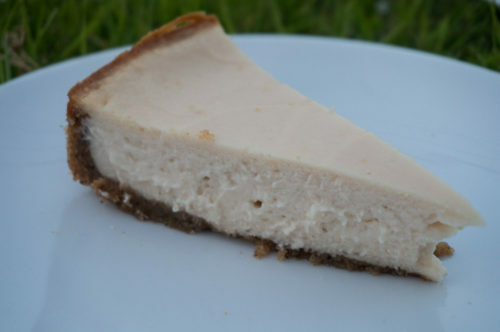 I made this cheesecake for vegans who need passover options. The crust is a mix of matzo meal and almond meal. You could make your own almond meal and throw in some matzo crackers if you have everything whole in the food processor. However, the recipe calls for the easy way. The batter is easy as well and quite thick so there isn’t really much of a chance of sinking if you leave it in the oven when it cools down quite a bit. I generally leave it a half hour (as written) or so to cool but I kind of forgot about this one and it sat for an hour, no harm done. It has a very light lemon and vanilla flavour so it is primed for your favourite toppings if you don’t want to eat it plain. 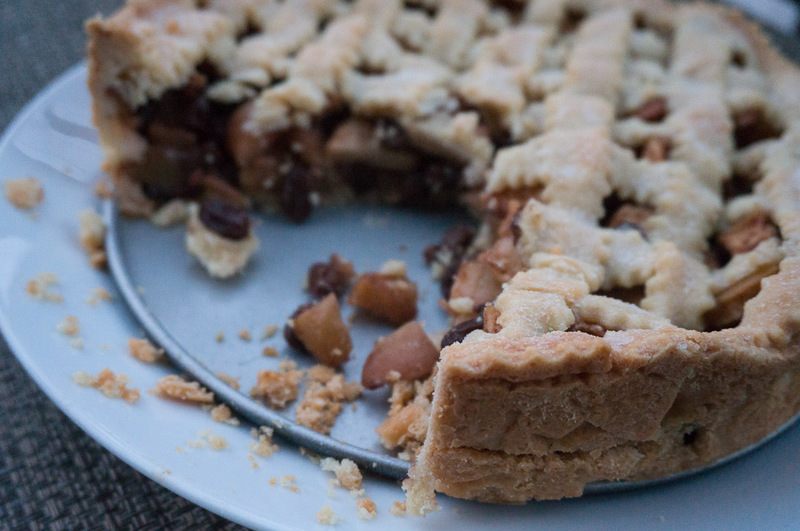 Add some cherries or strawberries for a beautiful spring dessert. I served it plain and got no complaints, so go ahead and indulge this passover season! 1 Tbsp cornstarch dissolved in 2 Tbsp soy milk or rice milk. Mix the almond meal, sugar, matzo cake meal, and salt. Stir in margarine until combined well. Press onto bottom and 1 inch up side of springform pan. Bake until crust is firm and a shade darker, 12 to 15 minutes. Cool crust completely in pan on a rack. Beat together cream cheese and sugar in a bowl with an electric mixer at medium speed until smooth, 1 to 2 minutes. Reduce speed to low and add non-dairy yogurt, cornstarch mixture,lemon juice, mixing until incorporated. Mix in zest and vanilla. Pour filling into cooled crust. Bake until filling is set 1 1/2 inches from edge but center is wobbly, about an hour (filling will continue to set as it cools). Once done, turn the oven off and leave it to sit in the oven for another 1/2 hour. Transfer cake in pan to a rack and immediately run a knife around edge, then remove side of pan. Cool completely, 2 to 3 hours. I just adore your blog name. It makes me smile when I think of it. I also love that your recipe is vegan. I’m putting this on my list to try. Happy holiday! I would never guess that this is vegan. It looks so good and just like a “cream cheese” cheesecake 🙂 Yummy!!! Great job! Lemon and vanilla sounds excellent to me! Such a beautiful cheesecake! I cannot believe it’s vegan! Ohh how I wish I had this recipe for our seder last week! I love how you adapted the crust to be kosher for Passover. And I agree about that chocolate toffee matzoh..we had those for dessert (along with my homemade macaroons), and I think I ate my weight in them! What a delicious looking dessert, thank you for sharing!! Matzo and almond meal together is new to me. Great cake idea! Mmmm. Cheesecake is a deathbed food for me and yours looks fabulous! 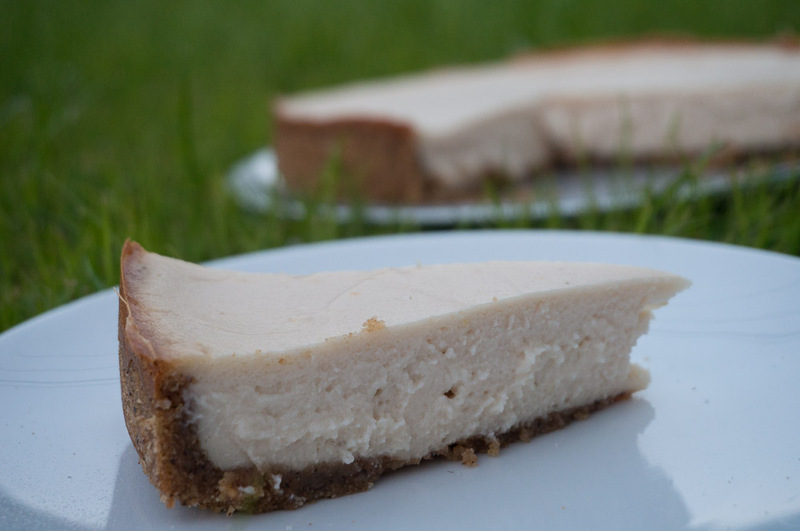 I’ve attempted to make vegan cheese cake a few times & it never looks this good! Mouthwatering! Can’t wait to try your recipe! This looks amazing! Lemon is one of my favorites! 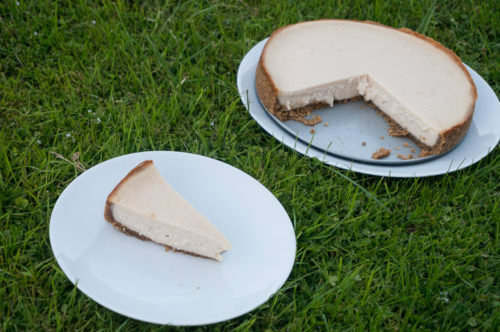 I have always wanted to make a vegan cheesecake but I never knew where to start or look for a recipe. I don’t do well with dairy so I was very excited to see this in the Sunday Supper dessert line up! This is perfect timing. I am putting this on my culinary bucket list.